I found this recipe on the cookinglight.com website and i thought it looked SOOO delicious! PreparationPrepare grill to high heat. Hi Megs, We love asparagus! As a metter of fact, we had it for dinner tonight. That recipe looks delic - we'll have to try it! 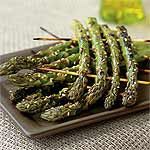 I love Asparagus! I am definately trying this one out this weekend! Yum! I will have to try that one too. I love all the fresh & yummy fruits and veggies in the summer. Who wants to be fit??? WII do! !